Dermalogica Moisturizer - Most know that the critical component of having fantastic skin is to moisturizer, moisturize, and moisturize. As we age, our skin looses the ability to hold onto moistsure. Moisturized skin glow, is soft, is supple, and helps slow the aging process. Not into wearing a heavy foundation? This moisturizer not only protects your skin from the sun, but it gives you an all natural touch of color. It's light coverage, intent moisture, and sun protection is perfect for those who are on the go. It is a sheer tint and is not meant to cover blemishes. Use a small amount. With fingertips apply over entire face and neck area. Active Ingredients: Octinoxate (7.5%), Zinc Oxide (5%)Inactive Ingredients: Water, Caprylic/Capric Triglyceride, Butylene Glycol, Methyl Gluceth-20, Dimethicone, Lactamide MEA, Glyceryl Stearate, PEG-100 Stearate, Stearic Acid, Cetearyl Alcohol, Extracts Of: Lavendula Angustifolia (Lavender), Juglans Regia (Walnut) Seed, Olea Europaea (Olive) Fruit; Lavendula Hybrida Oil, Cetyl Alcohol, Panthenol, Sorbitol, Glycerin, Pentylene Glycol, Polysorbate 60, Urea, Allantoin, Sodium Benzoate, Sodium Lactate, Lactic Acid, Sodium Chloride, Xanthan Gum, Disodium EDTA, Triethoxycaprylylsilane, Aminomethyl Propanol, Serine, Magnesium Aluminum Silicate, Phenoxyethanol, Methylparaben, Propylparaben, Linalool, Limonene, Titanium Dioxide (CI 77891), Iron Oxides (CI 77491, 77492, 77499), Mica (CI 77019). "It give me just enough coverage for the day." "I love that it comes in different shades. I use one in winter and one in the summer." "I have a natural glow with this moisturizer." "Is not heavy or greasy." "Broke me out just a tad until my skin got used to it. This Dermalogica moisturizer is incredibly light weight. The ingredients in this particular moisturizer helps calm and hydrate the skin. It really will not plug your pores or leave you feeling greasy and looking shiny. This is a fabulous Dermalogica moisturizer for anyone, but it is really great for those with oily skin. Oily, combination, and normal skin. Apply day or night to entire face with light upward strokes. Lavender (Lavandula Angustifolia) Extract, Caprrylic/Capric Triglyceride, Butylene Glycol, Methyl Gluceth-20, Dimethicone, Lactamide MEA, Stearic Acid, Octyl Methoxycinnamate, Cetearyl Alcohol, Polysorbate 60, PEG-100 Stearate, Extracts Of: Mallow (Malva Sylvestris), Ivy (hedera Helix), Cucumber (Cucumis Sativus), Sambucus Nigra, Arnica Montana, Pellitory (parietaria Officinalis), Watercress (nasturtium Officinale), Burdock (Arctium Lappa), Sage (Salavia Officinalis), Lemon (Citrus Medica Limonium), Saponaria Officinalis, Grape (Vitis Vinifera)Seed; Silk Amino Acids, Glycolipids, Hyaluronic Acid, Lavandin (Lavandula Hybrida), Palmitoyl Hydrosypropyltrimonium Amylopectin/Glycerin Crossploymer, Lecithin, Allantoin, Panthenol, Cetyl Alcohol, Glyceryl Stearate, Polyquaternium-10, Carbomer, Triethanolamine, Propylene Glycol, Disodium EDTA, Diazolidinyl Urea, Methylparaben, Propylparaben. "This Dermalogica moisturizer really absorbed quickly and had a very light feeling." "Is the perfect moisturizer to apply before my makeup." 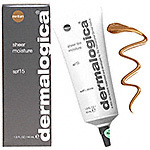 "I find that the moisturizer lasts a long time and is great right after the Dermalogica toner." How wonderful it is to finally find a lotion/moisturizer that hydrates but keeps oil under control? It is said to even sooth those inflamed painful blemishes, and you can rest assured that this lotion will not dry you out. This oil control lotion actually contains micro sponges that help absorb any excess oil. Thus leaving your skin with a beautiful matte finish. A really good Dermalogica moisturizer. This Dermalogica moisturizer is good for those with acne prone skin, and those with oily skin. It is also suitable for combination skin. After cleansing and toning apply over entire face. Apply with upward strokes. It can also be used under your makeup. Active Ingredients: Salicylic Acid. Inactive Ingredients: Balm Mint(Melissa Officianlis) Extract, Butylene Glycol, C12-15 Alkyl Benzoate, Potato Starch Modified, Glyeryl Stearate, PEF-100 Stearate, Acrylates Copolymer, Coneflower (Echinacea Purpura)Extract, Allantoin, Panthenol, Sodium PCA, Bisabolol, Willow (Salix ALba) Bark Extract, Phospolipids, Witch Hazel(Hamamamelis Virginiana)Distillate, Camphor, Menthol, DEA-Cetyl Phosphate, Cetyl ALcohol, Xanthum Gum, Disodium EDTA, Diazolidinyl Urea, Methylparaben, Propylparaben. "It has no fragrance, which I prefer." "My pores stay clear longer." "It does not irritate already existing pimples." "Really controls oil in my t-zone." "When applying under makeup, only apply a thin layer." "Does not moisturize my "dry areas" as much as I'd like."